Turner Motorsports, along with Great Clips, Inc., announced Monday that Kasey Kahne will increase his time behind the wheel of the No. 38 Great Clips Chevrolet in 2012 to compete in 15 NASCAR Nationwide Series events. Brad Sweet, who has competed on a limited basis in the NASCAR Camping World Truck Series for the last two years and in the USAC Sprint Car Series and World of Outlaws Series for Kasey Kahne Racing for the last four seasons, will make a run for the Rookie of the Year title and will round out the balance of the 33-race NNS schedule when Kahne is not behind the wheel. Kahne’s first NNS victory in 2003 came at Homestead-Miami Speedway. It was also Great Clips’ first win as primary sponsor. In 2005, Kahne captured his second career win at Texas Motor Speedway before stepping out of the ride as he progressed to the Sprint Cup Series ranks. In 2010, Kahne decided to return to the NNS on a limited basis and found himself back at the helm of the No. 38 machine, sporting the banner of his longtime sponsor. During both the 2010 and 2011 NNS seasons, Kahne piloted the car for eight races, racking up four top-five and six top-10 finishes. Following in the footsteps of Kahne, Sweet made a name for himself in the national open-wheel racing circuits. After being tapped to drive for KKR in 2008 by Kahne, Sweet won the Belleville Midget Nationals, the Knoxville Midget Nationals and both the Sprint Car and Midget “Four Crown Nationals” at Eldora Speedway. For his part, Sweet is ready to jump into this next phase of his career and is grateful for the support of Great Clips, Turner Motorsports and Kahne. 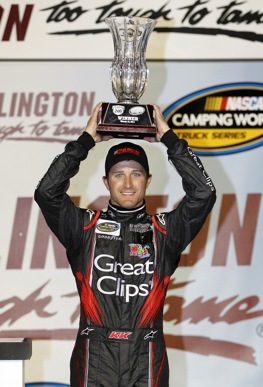 Great Clips, Inc. is currently the longest-running sponsor in the NNS and has used the Nationwide Series as their primary marketing platform for the last 11 years. Their sponsorship began in 2000 with Akins Motorsports as they climbed on board to sponsor the team’s No. 38 entry with driver, Christian Elder. Mark Green piloted the No. 38 for one season before general manager, Doug Stringer, hired up-and-coming talent, Kasey Kahne, thereby solidifying Great Clips commitment to their NASCAR sponsorship.